Agartala: Not one but two statues of Russian Communist icon Vladimir Lenin were brought down in Tripura amid clashes that erupted between Left and BJP supporters after the BJP swept assembly elections in the state, ousting Left party CPM after 25 years in power. A big political controversy has erupted that saw the CPM or Communist Party of India (Marxist) accuse the BJP of attacking its offices in Tripura and bringing down the Lenin statues. 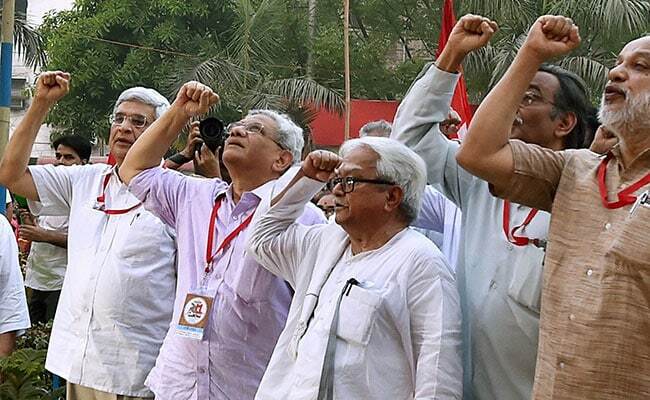 The CPM's Sitaram Yechury said his party will launch country-wide protests and he and other leaders staged a march in Kolkata on Tuesday evening. The BJP's Biplab Deb, who will take oath as Tripura's chief minister on Friday, warned that, "Anyone involved in anything like this will face action as per law." Union Home Minister Rajnath Singh has called up Tripura Governor Tathagata Roy and police chief AK Shukla, asking them to ensure peace and check violence till a new government is installed in the state. The thumping BJP victory on Saturday kicked off a frenzied celebration by the party's supporters which degenerated into clashes with their communist rivals and rioting. A five-foot-tall fibre-glass Lenin statue at the College Square in south Tripura's Belonia was uprooted and flattened by a mob with the help of bulldozers on Monday. It had been inaugurated by senior CPM leader Prakash Karat a few months ago. 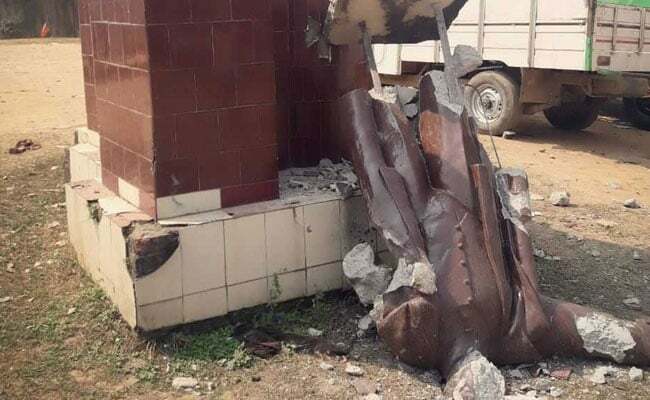 On Tuesday evening, it was reported that another Lenin statue had been brought down in Sabroom, about 50 km from Belonia, on Sunday. The CPM has alleged that the statue at Sabroom was brought down by BJP supporters. Police have filed a suo moto case. The Tripura police said they are also investigating more than a dozen complaints of arson, violence and vandalism. "We arrested a person who was driving the bulldozer that toppled the statue," Tripura police spokesman Pradip De also said. While images of the jeering mob reducing the statue to rubble sparked condemnation and Biplab Deb's rebuke, the BJP's Rajat Sethi said the crowd was responding to a "symbol of oppression". "This is simple catharsis," Mr Sethi told news agency AFP, adding, "It's a good and legitimate form of expressing their resistance against their symbol of oppression." Union Minister of State for Home Hansraj Ahir said in New Delhi that the government condemns all kinds of violence but "statues of foreign leaders are not required in India." Sitaram Yechury has urged democratic and secular forces of the country to come together against the ''fascist onslaught of the saffron regime." "So far there have been individual torture of 514 of our workers. A total of 1,539 houses have been attacked, 196 houses of our party comrades and leaders have been set on fire; 134 party offices have been attacked with 64 completely destroyed. In addition, 204 party offices have been occupied by the RSS and BJP," Mr Yechuri told reporters, adding that, "The CPM has decided to organise protest action all across the country." Mr Yechury also criticized comments made by Governor Tathagata Roy, who tweeted, "What one democratically elected government can do another democratically elected government can undo. And vice versa." In rare agreement with the Left was West Bengal Chief Minister Mamata Banerjee who too blamed the BJP. "If you (BJP) think that because you have come to power in a state (Tripura), you will destroy statues of Marx, Lenin or Gandhi-ji, we will not accept it," Ms Banerjee said, also making it clear that "I am against the CPM and Marx or Lenin are not my leaders. I have always protested against the atrocities of the CPM. Similarly, I will also not accept the BJP's atrocities."